It’s taken three races for us to see the Heineken-Formula E partnership in full flow. Local drinking laws in Saudi Arabia and Morocco prevented any form of acknowledgement of the Official Beer and Cider partnership, but in Santiago, Chile activation began in earnest. And you’d be hard pushed to miss it! Bright “Heineken Green” circuit branding around turns 8-10 of the temporary Parque O’Higgins circuit heralded the company’s ‘arrival’, the first true visual representation since the five-year partnership was announced in October 2018. Looking at Santiago, there were signs of familiarity. Within the E-Village, the company’s award-winning ‘When You Drive, Never Drink’ slogan – carried over from its Formula 1 partnership – was being pushed out with free samples of its 0% beer. Yet, for a company that specifically announced a move into Formula E as an opportunity to target millennials and Gen Z, and to use the platform as a ‘playground to play around with digital assets’ it was all fairly low-key. There was no obvious activation across any of the brand’s social platforms and very little social conversation about the partnership. As we’ve seen from Heineken’s Formula 1 partnership, the company has the power and ability to create clever digital campaigns, so it’s probably safe to assume that Santiago was used as a test bed for potential ideas rather than a full-blown activation opportunity. The company has stated it will have further activation at the Mexico City, Rome and New York City rounds of the championship, so we’ll just have to quench our thirst until then. We move onto wheels of a different kind in our next Shout-Out, one with which we have a geographical connection in Derby. Independent British UCI track team, Huub Wattbike, is making big inroads into the world track cycling scene. The team has been fighting against the world’s best national teams – and beating them. At the end of last year, the squad took its first major win at the UCI Track Cycling World Cup, beating the Belgian squad in the men’s team pursuit. More success in Manchester at the weekend saw them become National Men’s Team Pursuit champions. The Derby based team have high aspirations, and yet don’t take themselves too seriously, being referred to as citizens of Derbados. An amateur team with a great story, aiming for global success – a sponsor’s dream! Huub, the wetsuit and apparel specialists, have focused on elite athlete and local event sponsorship up until this point. In October 2018, the company announced its sponsorship of the track cycling team. Dean Jackson, owner and founder of Huub, stated that his company’s support of the team is a great example of local Derby businesses coming together to make great things happen. Having originally been ignored by the cycling establishment, Dean saw the potential in the team and wanted to support them and be part of their growing success. When BBC Breakfast presenter Sally Nugent referred to ‘the fantastically aerodynamic kit’ worn by Team Huub Wattbike to millions of viewers at the weekend, it’s fair to say that the sponsorship is paying dividends. Finally, we couldn’t ignore the Australian Open, which came to a fine conclusion over the weekend with Naomi Osaka and Novak Djokovic rightly taking the spotlight for their excellent tournaments. 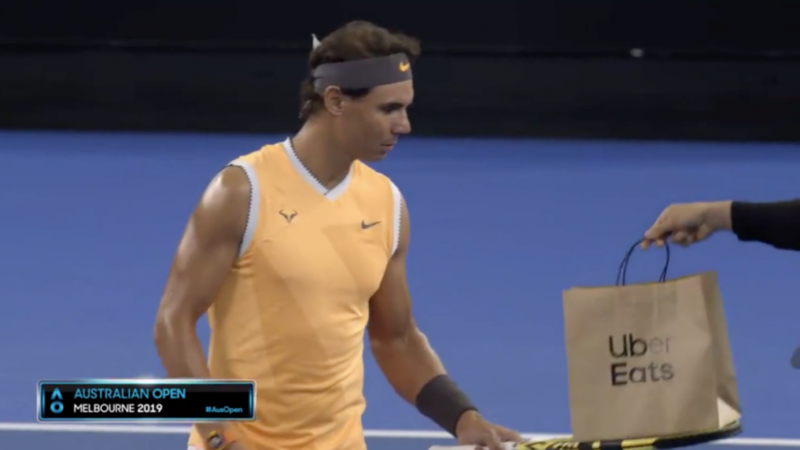 However, it was the in-between action that generated most chat among tennis fans as Uber Eats served up an advertising masterclass. For those watching the coverage on Nine in Australia, the broadcast sponsorship that featured as a bumper around the live coverage would have either have made you cringe or laugh out loud. Starting with what looked like a live shot from the Rod Laver Arena, the camera would focus on a player (Rafa Nadal, Caroline Wozniacki, Nick Kyrgios as examples) who would announce, with a Miranda-style turn to camera, what they were having for dinner. A doorbell would ring, and then the food would appear in an Uber Eats bag. Clever, simple, memorable and relevant, the adverts received praise from many on social media. There were of course those who became quickly tired of the heavy rotation ‘Tonight I’ll be eating’ ads. Either way, it got people talking with Uber Eats being lauded as one of the major winners from the tournament. The even bigger success story was the access to the players and the tournament that broadcast partners have been afforded. This was a significant factor for Nine when it took over the broadcast rights for the Australian Open from Seven last year. The network has worked closely with Tennis Australia to create ground-breaking creative and integrate sponsors into the tournament and the homes of those watching. It is a great example of rightsholder, broadcaster and partner working in tandem to create a win-win-win outcome.